All six first round matchups are set for this month's Ring of Honor Tag Wars tournament. 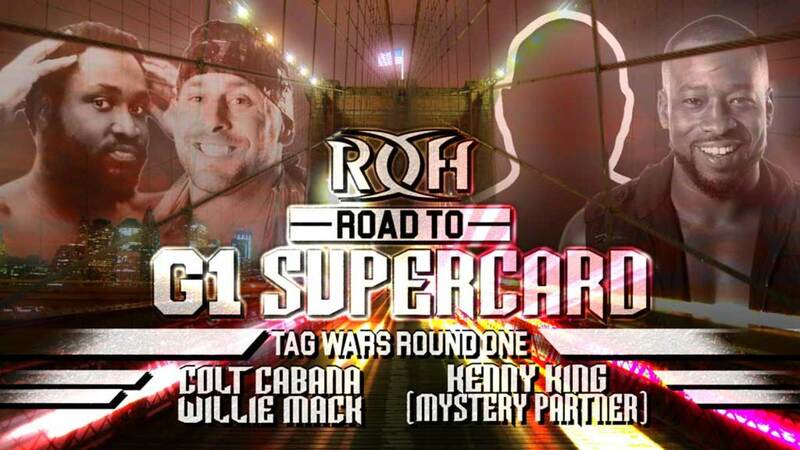 The tournament will take place across ROH's Road to G1 Supercard shows in Texas. Three first round matches will be held in Dallas on January 24, with the last three first round matches taking place in Houston on January 25. The tournament will then conclude in San Antonio on January 26. There will be two three-way tag matches between the winners from the first two shows, with the winning teams advancing to the finals later in the night. The team that wins Tag Wars will receive an ROH Tag Team title shot at the promotion's 17th Anniversary pay-per-view in Las Vegas, Nevada on March 15. They'll also get a spot in the Crockett Cup tournament, which is being held in Concord, North Carolina on April 27. Cabana was originally set to team with Flip Gordon before Gordon suffered a right knee injury at Honor Reigns Supreme this Sunday. Gordon's injury is believed to be a sprained MCL. Fredericks and Coughlin are young lions from New Japan Pro Wrestling's dojo in California. At Road to G1 Supercard: Houston, they're set to team with fellow young lion Clark Connors in a six-man tag match against Villain Enterprises (Marty Scurll, PCO & King).